In every major war, attacking armored forces have halted at critical moments because of a lack of fuel. Fuel trucks ride on tires that often become bogged down in mud or rough terrain while tracked armored forces push ahead. Sometimes supply roads are clogged with reinforcements or refugees. Sometimes coordination fails along a lengthy fuel supply chain that must offload fuel from ships, store it ashore, truck it to forward dumps, and then truck it to combat units. Sometimes airdropped or helo landed forces run short of fuel before they can link up with ground supply sources. In 1991, the modern US Army had six months to prepare to invade Iraq. As lead elements of the 24th Mechanized Infantry (i.e. Armored) Division approached its objective of cutting off fleeing Iraqi forces, it ran out of fuel. The USA had complete air superiority, helicopters, satellite phones, computers, and the best soldiers in the world, but was unable to provide emergency fuel. The US Army still lacks a method for rapid refueling on the battlefield, or remote refueling in difficult areas like Afghanistan. The solution is a KCH-53 helicopter squadron for every Army Corps. The US Marine Corps is developing an upgraded CH-53E called the CH-53K. The US Army should join in this buy and embark the Marine Corps Tactical Bulk Fuel Delivery System, which provide another 2400 gallons as internal cargo. This KCH-53K variant should have larger internal fuel tanks that can carry 3000 gallons of fuel, like today's Navy MH-53Es. (above) This would allow it to carry a total of 5400 gallons of fuel. It should include fuel pumps and two long fuel lines to rapidly refuel vehicles directly, or draw the fuel itself for a range of thousands of miles for unique missions. The US military already has the ability to move fuel by helicopter with bladders, but this has several drawbacks. Bladders are carried externally and limit the helicopters speed to 50 knots making them very vulnerable to ground fire and cutting their range in half. A KCH-53 could move more fuel forward twice as fast and land to instantly refuel vehicles, whereas bladders require bulk fuel men on the ground with pumps who must set up and tap the bladders. Lowering fuel bladders is also dangerous since a rupture can shower nearby troops with fuel. In contrast, a KCH-53 can land and begin refueling within a minute. In rough terrain, the helicopter can hover and lower the fuel lines. For very long range missions, a KCH-53 with its aerial refueling boom can shuttle fuel from KC-130s or HC-130s overhead to ground forces below. The US Marine Corps used this technique in Afghanistan in 2002. KCH-53s could also supply "Forward Arming and Refueling Points" used to support smaller helicopters. The Army has already configured a few UH-60s as "Gashawks" to refuel small helicopters, but a KCH-53 could refuel a dozen. 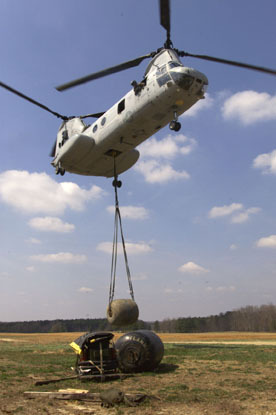 The Army CH-47F can lift three 800 gallon fuel tanks internally to serve as refueler for short-range "Fat Cow" missions. However, the KCH-53 could carry twice that amount much longer distances with crews well-trained for refueling missions. The gas guzzling M1 tank has a 500 gallon fuel tank, so a tank company needs around 7000 gallons to completely refuel, something that a pair KCH-53 could accomplish after flying hundreds of miles. The biggest advantage of KCH-53s is an ability to refuel directly from any Navy ship, including tankers. External bladders can be flown from ships but this requires special crews aboard the ship and bladders of fuel on deck are dangerous. Direct ship-to-armor refueling can bypass the extensive logistical chain now required. During the 1991 Persian Gulf War, KCH-53s could have moved fuel directly from ships in the Persian Gulf to tanks in the desert. Ideally, the Army would forward-base KCH-53s near its overseas based fuel tankers and cargo ships so they can piggyback to an area of conflict and immediately support air-landed forces with fuel from hundreds of miles away, and evacuate wounded back to ships. 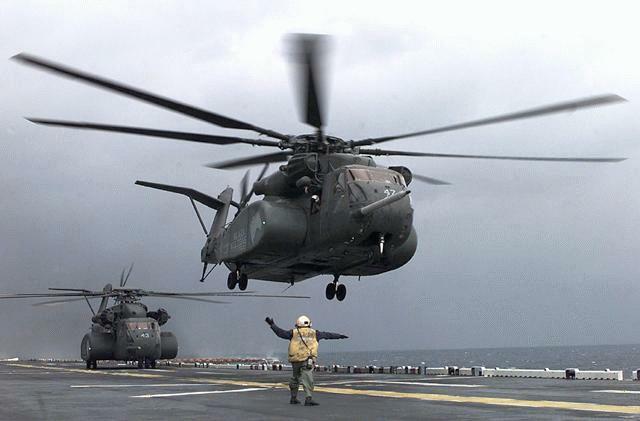 Although KCH-53s would be in high demand to move fuel, they could disembark their internal fuel tank and fill the heavy lift helicopter role and carry tons of cargo or dozens of personnel. Despite the advantages of helicopter refuelers, it is not economical to move the bulk of fuel in this manner. While fuel from seagoing tankers is delivered to ports at a cost of only $2 a gallon, it can cost up to $50 a gallon to deliver it far inland by truck, and up to $400 a gallon by air. However, the large capacity KCH-53s can cut that cost to $200 a gallon to rush fuel to units with urgent needs. If the KCH-53 were available today, it would be the only helicopter capable flying from Navy ships offshore to anywhere in Afghanistan without the need to coordinate aerial refueling support, which is extremely dangerous at night. The Army may be concerned about adding another helicopter type to its inventory. However, it has a requirement for a larger helicopter than the CH-47 and a variant of the new CH-53K is the logical choice.